The problem with belated sequels is not their belatedness (although, to be honest, that does not help). No, the problem is that this may be the ultimate sign that Hollywood has little-to-no interest in original stories. As if the remakes, reboot, and timely sequels weren't bad enough, to reach back decades in an attempt to revive a series not only looks like the industry rejects anything fresh, it looks like desperation. The truly sad thing is that some of the movies probably had an acceptable window for release way back when, but for something to suddenly reappear years late can not only seem fishy, it may be unwelcome. Will that be the fate of 20th Century Fox, as they attempt to create a franchise far too late with Independence Day: Resurgence? Just as in real life, Independence Day: Resurgence takes place 20 years following the events of the first film. That movie saw Earth invaded by an advanced race of hostile aliens. However, the humans were able to band together and defeat the visitors. We learn that a lot has happened since that time. Humanity has been able to set aside their differences and live together in harmony. Scientists have been able to adapt the alien technology to create new anti-gravity vehicles and weapons. The opening of the film sees Earth preparing to celebrate the 20th anniversary of the victory. As President Landford (Sela Ward) prepares to address the world, pilot Jake Morrison (Liam Hemsworth) and is co-pilot Charlie Miller (Travis Tope) are participating in an event at a base on the moon. These festivities end when a huge alien craft -- 3000 miles in diameter -- appears and lands on Earth, creating tidal waves and wreaking havoc. 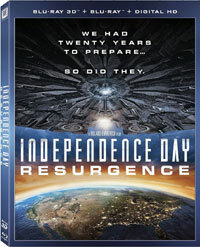 David Levinson (Jeff Goldblum) is called back from a UN mission in Africa to help deal with this new threat. President Whitmore (Bill Pullman) senses the alien's presence, while Dr. Brakish Okun (Brent Spiner) awakens form his 20 year coma. These individuals will pull together to see if they can once again turn back the alien horde. If you study film history, you read a lot about event films from Hollywood's golden age. In my lifetime, there have been only a handful of event films that I clearly remember. One was 1989's Batman, where I remember standing in a line which went around the building. Another was 1996's Independence Day. From the teaser trailers which revealed a little more each time to the series of early one-sheet posters (my wife got me the complete set), this was the epitome of hype and we certainly fell for it, as the movie was a smash and I can remember seeing it in a packed-house on opening night. Did it live up to the hype? Sort of. The movie certainly offered some great visuals and another odd turn as the hero by Jeff Goldblum, but it did not deliver the amount of fighter jets vs. alien ships promised in the trailers and the ending was idiotic to say the least. But, the movie was definitely a crowd-pleaser, as it went on to make over $300 million at the box office in the U.S. Given that last part, it was somewhat surprising that a sequel to Independence Day didn't appear. Of course, the story ended and the aliens were destroyed, but Hollywood has brought sequels back from much more dire circumstance. But, filmmaking partners Roland Emmerich and Dean Devlin moved onto other projects in which they destroyed landmarks, and most of us put the thought of a sequel out of our minds. So, it was a bit of a shock when a continuation of the story was announced. The tagline for Independence Day: Resurgence is "We Had Twenty Years to Prepare. So Did They." Similarly, the five (yes, five) screenwriters involved with this movie had twenty years to come up with a new story. So, why did we get a movie which is nearly a carbon copy of the first one? Sure, a few things are different, but not much. This time, we get two sassy pilots, Jake and Dylan Hiller (Jessie T. Usher), the son of Will Smith's character (as Smith opted to appear in Suicide Squad). We get politicians and military officials arguing over how to handle the situation. We get Jeff Goldblum being Jeff Goldblum, and Brent Spiner chewing even more scenery as Dr. Okun. We get refugees traveling cross-country. We get failed attempts at stopping the aliens and a mid-air dogfight sequence. Yes, if it was in Independence Day, then you will probably find it here. The only departure is the finale, which brings the fight to Earth and introduces a new kind of alien. It could easily be argued that Star Wars: The Force Awakens was simply a remake of Star Wars, with a few tweaks. But, that film worked as it offered enough action, humor, and emotion for us to ignore the fact that we'd seen it before. Independence Day: Resurgence takes ideas from what is, in hindsight, a decidedly mediocre movie and simply recycles them, creating a second generation dupe which is not satisfying. I went into this movie hoping to be pulled back into that universe, not to simply see the same movie again. Independence Day: Resurgence has some interesting ideas -- I truly like how the alien technology was adapted -- but it relies too heavily on the formula (and plot-points) on display in the first film, and it really goes nowhere. Goldblum has some funny lines and it's always great to se Bill Pullman on-screen, but the lack of new concepts is truly staggering. Now one can't help but wonder if the proposed third film will ever see the light of day. Independence Day: Resurgence gives the White House a break on Blu-ray Disc courtesy of 20th Century Fox Home Entertainment. The film has been letterboxed at 2.35:1 and the Disc contains an AVC 1080p HD transfer which runs at an average of 28 Mbps. The image is very sharp and clear, showing on overt grain and no defects from the source materials. The colors look good, although most of the film is once again bathed in blue, and the image is never overly dark or bright. The picture has a nice amount of depth and the level of detail is notable. The Disc carries a DTS-HD Master Audio 7.1 track which runs at 48 kHz and an average of 5.0 Mbps. The track provides clear dialogue and sound effects. This is a very muscular track which truly rocks during the action sequences. We are treated to highly detailed effects which allow us to pick out individual sounds from the rear channels. The stereo effects highlight sounds coming from off-screen and the subwoofer is palpable. This set also includes a Blu-ray 3D where the film is letterboxed at 2.35:1 and the Disc contains an MVC 1080p HD transfer which runs at 25/15 Mbps. The 3D effects here are OK at best. There is notable blur on most shots and the background is constantly just a fuzz. While some shots show depth, we never get any true demo moments where the 3D is stunning. The image is never dark, as can be the case with 3D, but I expected many more cool 3D effects. The audio track is the same as that found on the Blu-ray Disc. The Independence Day: Resurgence Blu-ray Disc offers a handful of extras. We begin with an AUDIO COMMENTARY from Director Roland Emmerich. The Disc contains eight DELETED SCENES which run about 8 minutes and can be viewed with commentary from Emmerich. These offer an alternate opening, a moment with some shoddy blue screen, evidence that the White House did not survive, and Sela Ward's fate, along with some other brief segments. "The War of 1996" (5 minutes) is a fake newscast which gives an overview of the first film and fills in some gaps since that time. "It's Early ABQ!" (3 minutes) is a fake morning show featuring Fred Armisen interviewing Judd Hirsch's character. "Another Day: The Making of Independence Day: Resurgence" (55 minutes) is a four-part featurette ("A New Squadron", "Earth as We Know It", "The Tools of the Future", and "The Invaders") which offers interviews with the cast and creative team, on-set footage, concept art, and visual effects information. We get a 6-minute GAG REEL, a reel of CONCEPT ART, two THEATRICAL TRAILERS, and a TV SPOT.